Why are Red Bud Trees’ blooms purple? I guess someone could have called these pretty trees PurpleBuds, huh? I have no idea why the blooms are purple, but from afar the trees may appear red compared to the rest of the plain-looking scenery at this time of year. That’s one of those questions you can save for when you meet the Great Spirit in the Sky! Just to let you know, that my husband and I, and a young couple we are close friends with have noticed and truly enjoyed the burst of purple blossoms on the Red Bud each year. We are very fortunate to have an abundance of them growing along the banks on our roads. I hope we did’nt break any laws, but we found to very young trees growing among a large group, and dug them up and immediately planted them in our own yards. Hopefully the will produce another group of beautiful blooms in the future. And create another group close by. Hey Nancy – The redbud is one of my favorite bloomers in Spring. The color is amazing and the leaves don’t interfere with the burst of color until we’ve appreciated them for a while. How tall were the ‘little’ trees that you transplanted? I have two small trees that were planted here a few years ago that are now 6 ft. tall but they didn’t bloom this year. They’re growing slowly but I’m still hopeful for a bloom next year! Good luck! years old, it has buds, just a few, so cute. That’s great that your young little tree has some buds. How much sun is it receiving? I have two trees that have so far refused to flower. I will try to help them out with some fertilizer this year, what else can I do but wait? Perhaps they were planted in too shady of an area on our ridge to be able to bloom very often. I’m still hopeful for next year, though! You don’t have to worry about us zipping down the highway without noticing. I too delight in the color whenever driven through PA and just recently VA. Thank you for this site. I’ve wanted to know the name of such beauty. I live in ME so we don’t have the color from those trees as part of our spring. The redbuds are going strong now and it’s the last week of April. It’s too bad their pretty color doesn’t last very long. At least you can get down to more “southern” states once in a while to see them blooming as you drive by. 🙂 Thanks for verifying their northern limits for us. 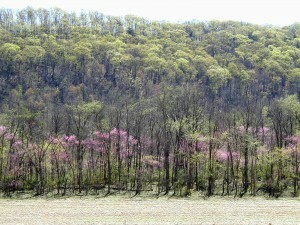 Why do redbud trees grow mainly along the highway and not away from the roadside? 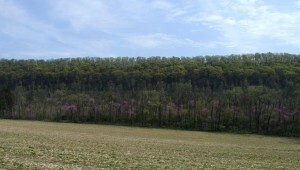 This week (middle of April) has been a beautiful week of blooming redbuds in central PA! We see most of them at the side of the road for that is where we are at. Go into the forests and you’ll see plenty of redbud trees blooming in places near the edge of the woodlands — like where an agricultural field meets the forest it was carved from. Redbud trees would be considered understory trees as they only reach 20-30 feet tall. I would guess that most are more like 15-20 feet tall. Perhaps they need more light like you’d find near the edge of a forest and so we find them also at the edges of the road and along streams. If the main means of propagation is wind-blown seeds, then the edges of roads and forests is where the seeds will most likely settle down to find a space to grow. Apparently, the redbud seeds aren’t significantly dispersed by animals so we do tend to see several trees growing in favorable areas together. Good question! Thanks for posting it.